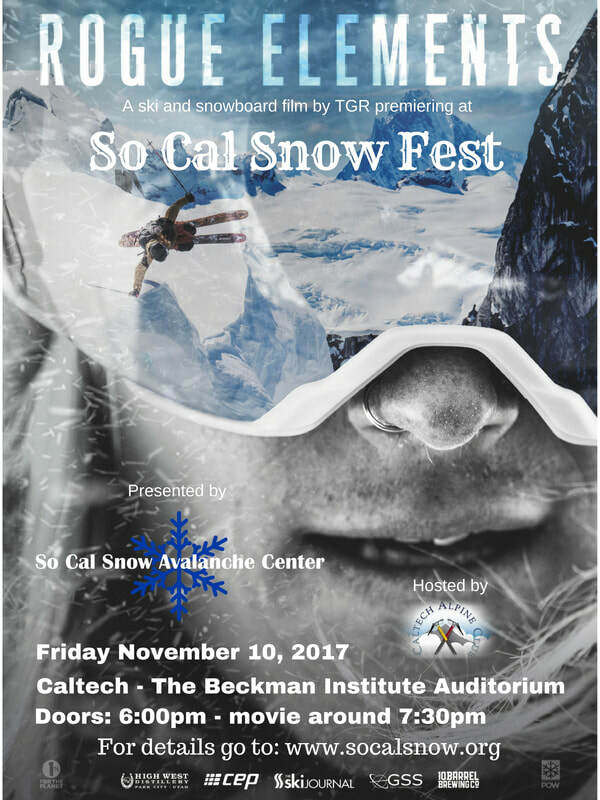 So Cal Snow Avalanche Center has once again teamed up with Teton Gravity Research to bring you So Cal Snow Fest. The annual Avalanche Center fundraiser featuring the premier of "Rogue Elements" the latest film from TGR. Come join So Cal Snow Avalanche Center and celebrate your passion for the backcountry. Enjoy great food, beer and TGR's latest release "Rogue Elements" There will be our legendary raffle and silent auction with gear we all drool over. All proceeds go to support the avalanche center and all of it's programs. Celebrate the love of the outdoors and good times while supporting a great cause. For more details about our fundraising campaign please visit the Fundraiser Program page. ​$15 for the event and can be purchased here online or at the door. All tickets will get you a wrist band for the event one beer ticket and a raffle ticket. All proceeds from the ticket sale goes to support So Cal Snow Avalanche Center. Every ticket purchased gets one free raffle ticket! ​Bring your receipt from purchase to receive your wrist band. More events TBA for the 2017/18 season. Keep checking back here!